So, I've been crafty again. I mean, it's nearly Christmas, so that makes sense, I'm exactly the type of person that loves to DIY Christmas presents, and not just because I'm broke! It's just what I do. The one on the left is mine, and the one on the right is Shannon's. Initially mine came out really muddy, I think I overmixed or something, so I actually added in more orange and turquoise and used a swiping technique to spread it and mix it, and in the end I was fairly happy with it. Shannon's was just beautiful from the beginning, she was very proud of herself. However, after drying for some reason the orange in mine faded to almost invisibility, making the whole thing look rather dull, and I was not happy with it. Shannon's stayed lovely, and was left alone. 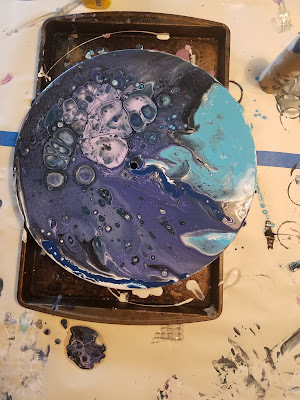 But I decided to do a new pour overtop of mine and try not mixing quite so much. The second time I chose a different color palette. This one came out super, super cool and I was amazingly happy with it. Look at all those cells! And it dried just fine too, which I was also happy about. 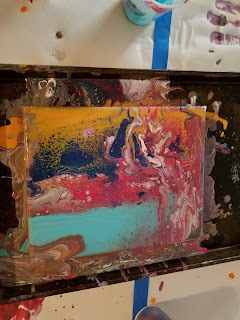 However I had too much paint mixed up for pouring, so to avoid wasting it I needed something else to pour on. I ended up using a smaller canvas and an old clock I had from years ago, which I intend to buy new clockwork for, because it looks so cool now. 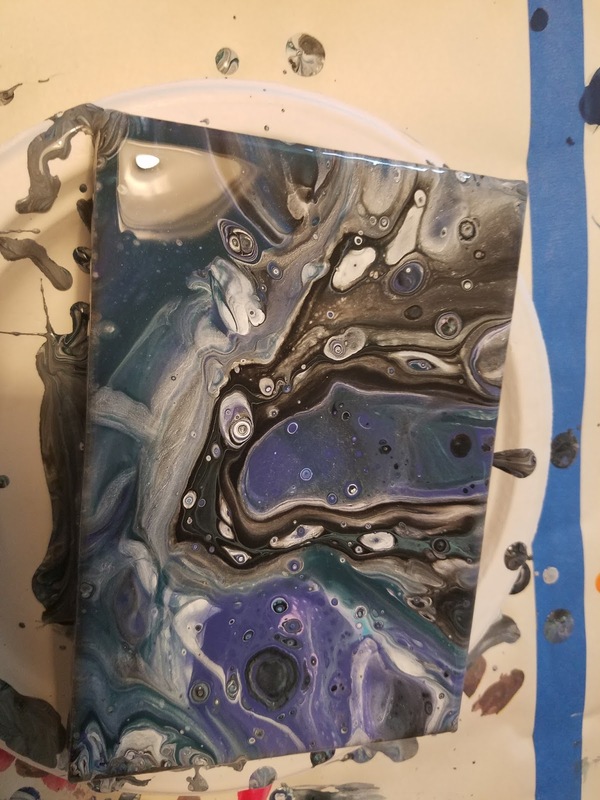 This one came out super amazing, I love the way the cells form in the middle of the paint. 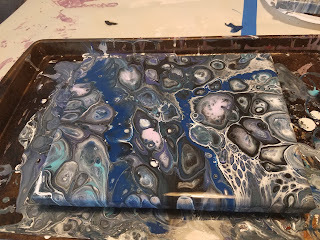 What's really fascinating about these pours is that more cells and shapes will form as it sits, making it look cooler and cooler as it dries. 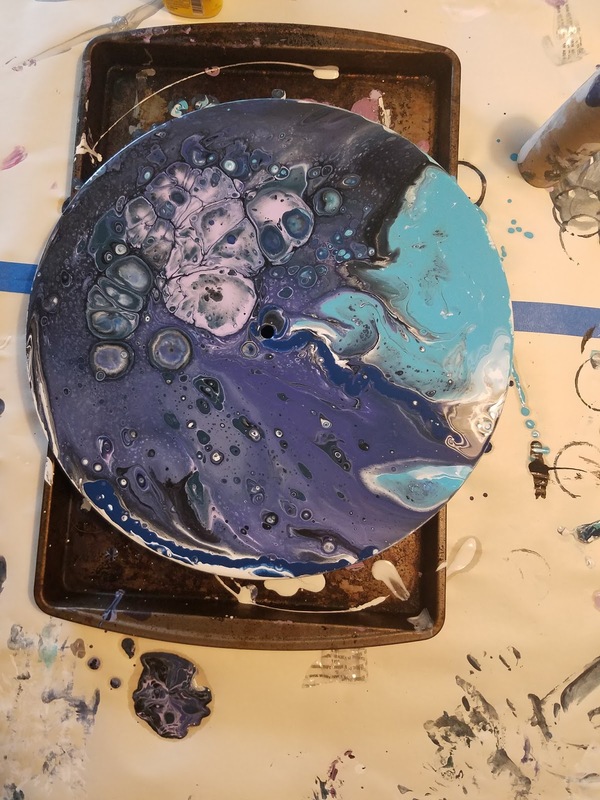 I'll show you here with the clock I painted, the one on the left is right after I poured the paint, and the one on the right is after it had been sitting for a few hours. 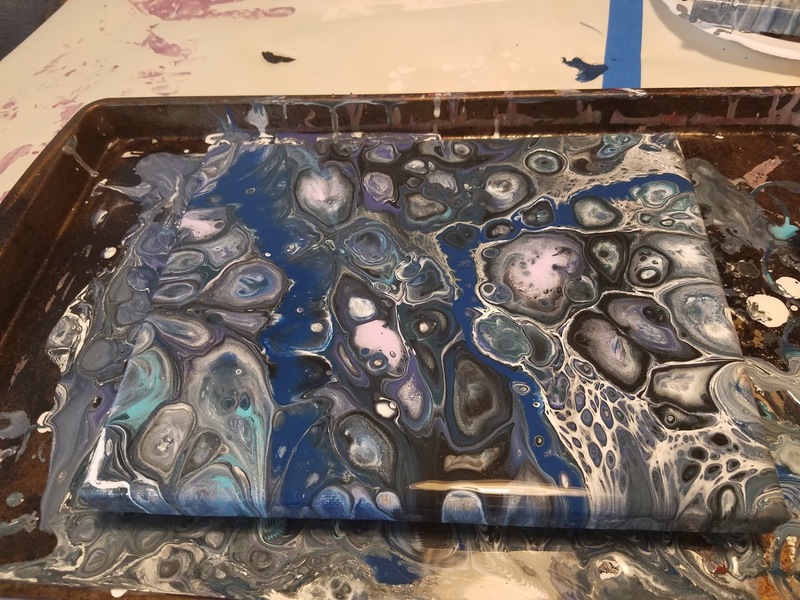 You can see how there are a lot more cells and swirls in the second picture, it's so cool! 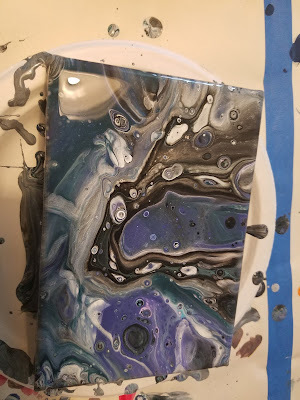 One of the youtubers whose videos I watched to learn how to do this does all her pours on six inch ceramic tiles, which gave me the idea to do a set of them as coasters for my mom for Christmas. I haven't done them yet, but that's coming, you'll get pictures when I do. 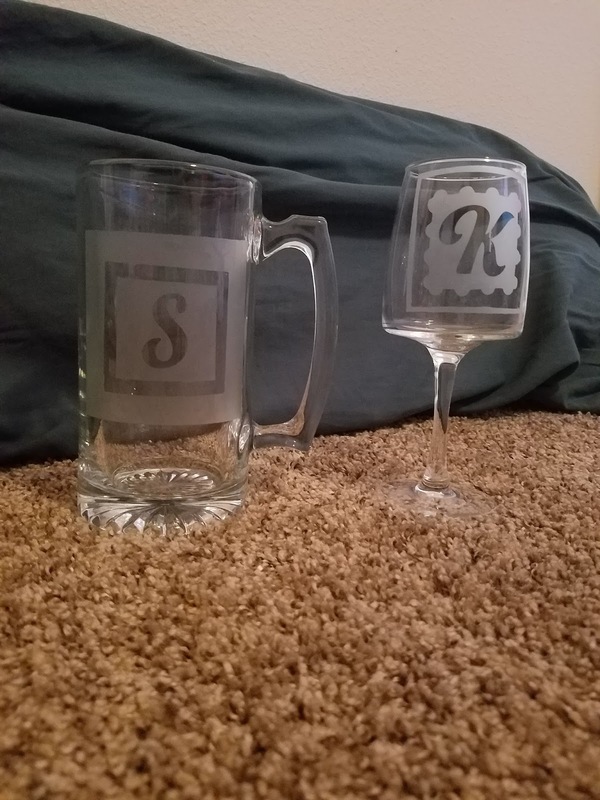 The other thing I decided I wanted to do as gifts for people was etched glasses, wine glasses or beer mugs, depending on the person. 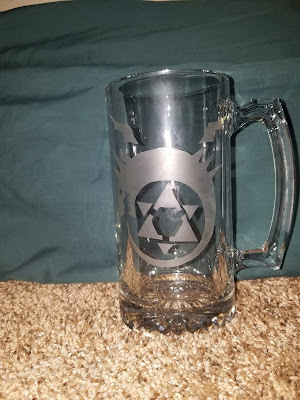 I got the idea because I wanted to get one for Rachel with the homunculus tattoo from Fullmetal Alchemist, but even when I could find a reasonably priced glass, the shipping would cost twice as much. I knew that Danny, Stu's roommate, happened to have a bottle of glass etching cream he had used for something some time ago, and had told me previously that I was welcome to use it, since I've been curious about glass etching before. 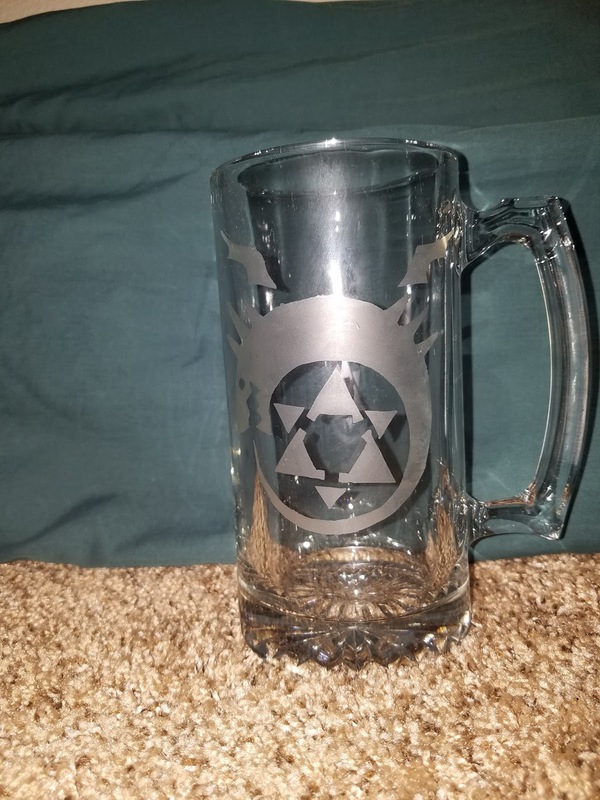 So I decided to make my own glass for Rachel. And then the decision I made to go with Stu to his parent's house in Arizona for Christmas led to me needing gifts for them, which led to more custom glass ideas, and then that led to a set for my dad and step mom, and then my brother, and then birthday presents for some friends with an idea I'd been wanting to do for ages, and then one for Danny for letting me use his etching cream since I know that stuff isn't cheap... and well, I etched a lot of things. I bought a lot of beer mugs and wine glasses from the dollar store, which was pretty great, because I knew it would be cheap and easy to redo if I messed something up. I also bought some stick on shelf liner from the dollar store because it would make perfect sticky but removable stencils. I printed off all my different designs at work, and then I would tape each design to a piece of shelf liner, cut it out with an xacto knife, and stick it to the cup. It worked really well, with only a few small instances of etching cream seeping a bit under the edges. I started with the glasses for Stu's parents. Simple monogrammed glasses.These were just stickers and tape, no shelf liner here. I got a little fancy with borders, but I kept it pretty straightforward since this was my first time doing it. But they came out really well, and I'm happy with them. Nice, simple gifts for my boyfriend's parents, since I'm spending Christmas with them. Next I did Rachel's glass, but the placement was bad so I decided to redo it, and it came out much better the second time. Photographing etched glasses is so hard, the flash brings out the etching but creates so much glare on the glass. Plus, with this one, the design was a bit big to easily capture. But it looks really cool. After that I did my dad and stepmom's. Wendy loves dragonflies, so that was an easy choice. For my dad, I chose to do his crest from his persona in the medieval recreation society he's part of, basically it's the symbol that he paints on his shield and things like that to represent himself. See what I mean? Glare. Uhg. But they both came out really well. My dad's was a challenge with all those little details, the dots are actually supposed to be stars, but I tried to cut out two stars and realized this was never going to work. Luckily one of my dad's shields does have circles instead of stars, so this is totally legit. Next was my brother Josh's gift. My family always just does a name draw for Christmas presents, since I have four brothers and that's a lot of gifts to buy. This way we each only have to buy one, and I got Josh. This is another one where it was difficult to capture the full image. 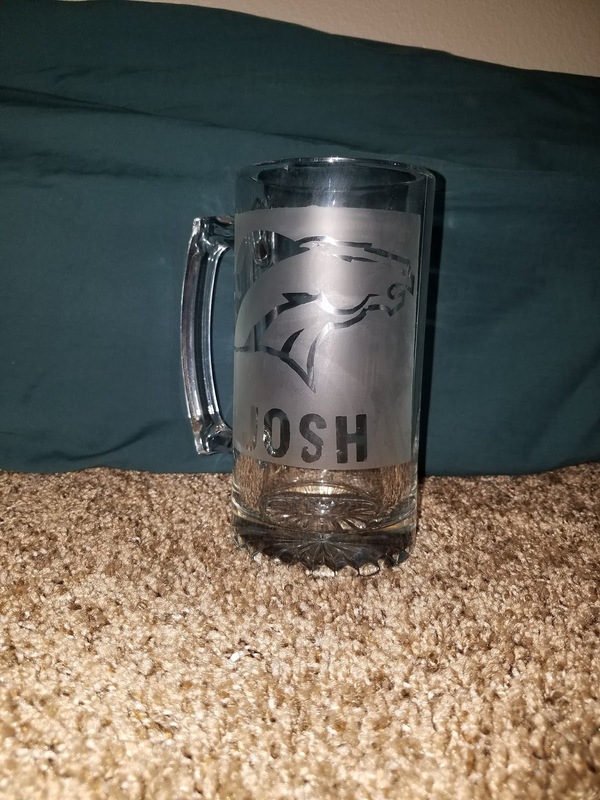 Josh is a Denver Broncos fan, so it's just a Broncos logo and his name. Pretty simple, although cutting out and placing some of those thin lines was a challenge. I nearly put his name as 'Doshie' instead of Josh since that's what I used to call him when I was little. It might have been funny, but I decided against it. 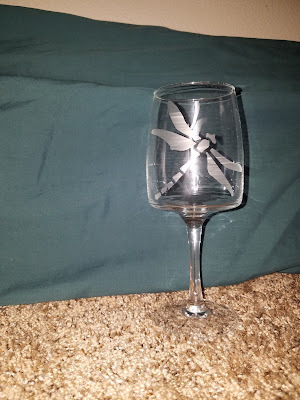 The last actual Christmas glass I did was for Danny, to thank him for letting me use his etching cream. I wanted to do the sign of the Prancing Pony from Lord of the Rings, because Danny is super into LOTR. But goddamn, did that have some fine lines and tiny details. Just getting it cut out was a challenge. I was not sure it would work. After it was cut out I actually placed a second layer of shelf liner over it to hold everything in place while I took the backing off and then stuck it to the glass, and then very carefully removed the top layer. It actually worked pretty well. There's a little bit of blurring of lines around the horse's front legs, but it wasn't a complete disaster, and I'm pretty happy with how that came out. Not that I want to try something that detailed again, haha. That was a challenge. 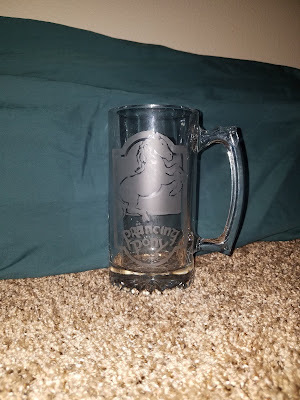 After that, I did two wine glasses and a beer mug with a phrase I'd seen on etsy and wanted, but didn't want to pay nearly $30 a glass. It says "Because Kids" if you can't read it. 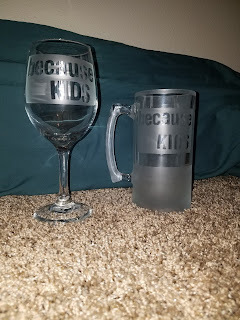 I did two wine glasses because one is for me and one is for my friend Cari, and the mug is for her husband Matt. I already have a Christmas present for Cari, so these glasses are going to hang around until their birthdays, I think. So that's all the glass etching I did. It was quite a bit, but a lot of fun to see the designs come out. It did make me wish I owned a Cricut or a Silhouette cutting machine so I didn't have to cut all this stuff out myself though. I still own two other plain wine glasses that I think I may try to come up with something for before I return the etching cream though, because cups with designs are just so much more fun. 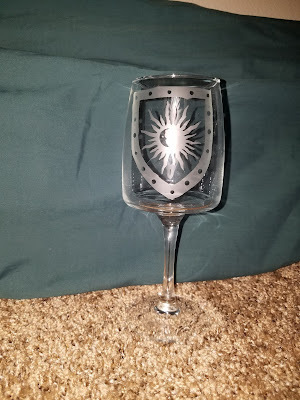 Speaking about fun glasses, some time ago I found a wine glass on Etsy that I just had to own. 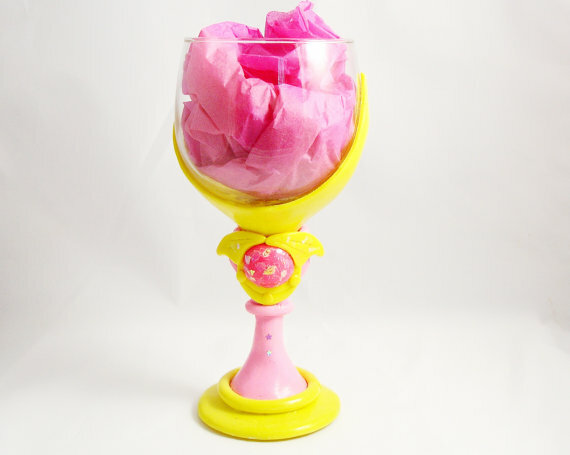 I mean, it's the goddamn Crescent Moon Wand from Sailor Moon in the form of a wine glass. I just... I just didn't understand a universe in which I didn't own this glass. Sadly for me, this one was already sold. So I immediately messaged the Etsy shop owner offering just all the money for one of these. This was in April of this year. And I got... crickets. Nothing. No response. I investigated the seller's shop, all the reviews were good except for the most recent one from December of 2016, where the shop owner basically stopped communicating with the customer, never sent the ordered item, and ended up just cancelling the order with no warning or reason. There had been nothing since then, despite the fact that the seller's shop appeared to still be up and running. I realized for some reason this seller had dropped off the face of the planet. I continued to wait for a bit, hopeful. But I eventually realized I wasn't going to hear anything. And then I had this idea. I mean, I'm a crafty person. 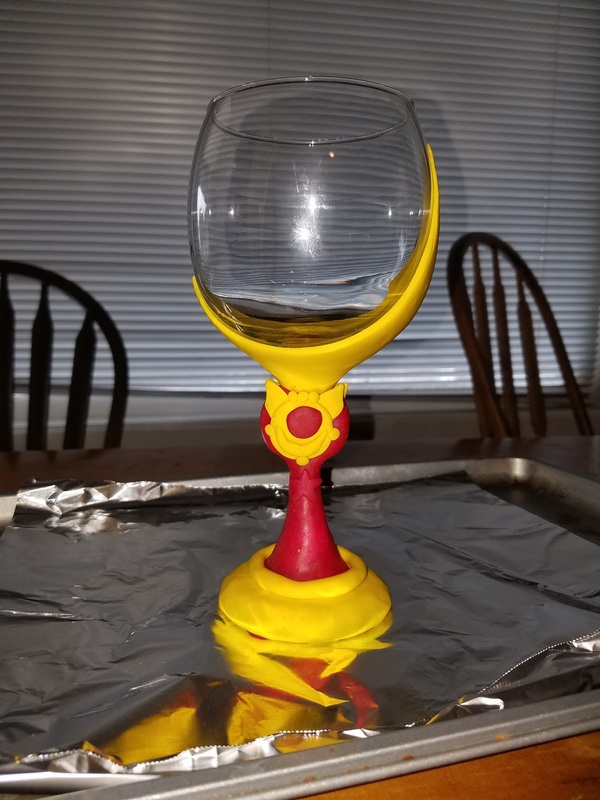 The decorations on this glass were made of polymer clay, and I may not be a sculptor, but these were really pretty simple shapes. I bet I could do that. So I bought an extra wine glass when I was buying stuff for etching, and got some pink and yellow Fimo from the craft store. To start with, I made a long, fairly wide yellow oval and pointed the tips. 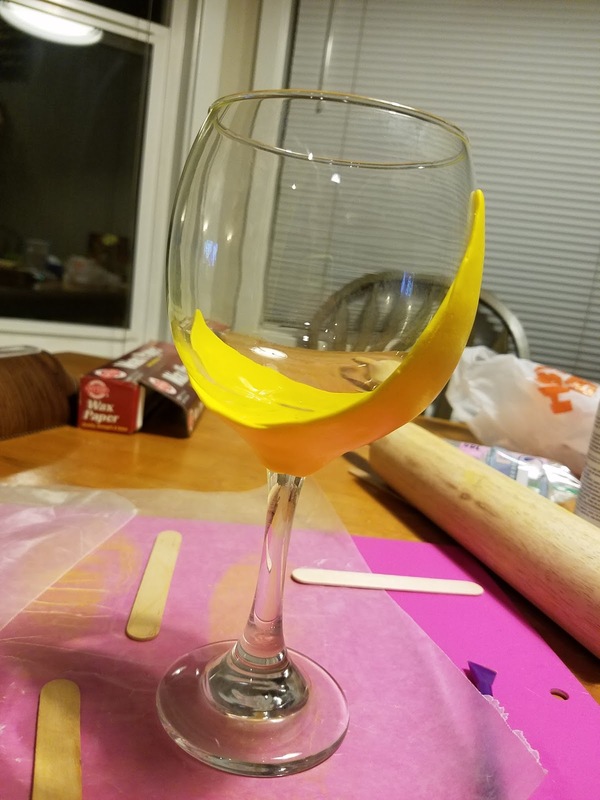 I cut a slit a little further than halfway to allow me to wrap it around the wine glass stem, and then shaped that to the curve of the glass. It actually ended up being slightly too far to one side, so I just rolled a small snake of clay and pressed that into the too narrow side and smoothed them together, using an xacto knife to neaten and straighten the edges. After that I covered the stem in a thin, but not too thin, layer of pink clay, and covered the base in a layer of yellow. I rolled a thicker snake of yellow that went around the seam between the pink and yellow at the base. Then I made a ball out of the pink clay, just sort of eyeballing the size, cut it in half, and then, lining it up with the direction the crescent was going, smoothed that into the top of the stem. For the decorations on that round part, I made two small yellow disks, slightly smaller around than the pink part, made two smaller red circles out of the clay I still had left from my Sailor Pluto earrings, put those on the yellow circles near the top, made small crescent moons and the little wing/ribbon things that come out of the top of the circle, and a dozen tiny yellow balls. Put them all together based on my reference, and got something that looked pretty damn accurate. After that was done I added two small pink stars just under the round part. 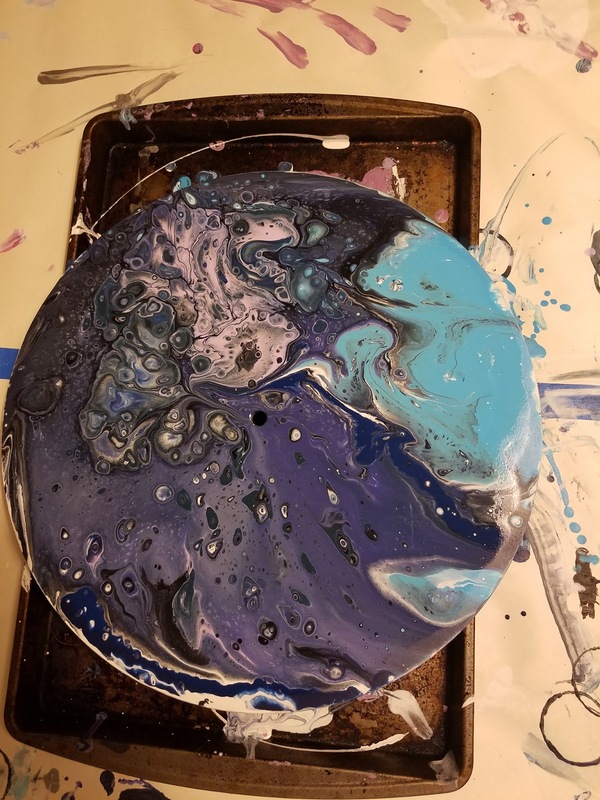 Obviously since I was making two of everything I was mirroring each side so they'd both look good no matter which side you looked at the cup from. For the record, my version is more accurate than the Etsy glass, she just did a sparkly ball with some weird wing things that don't look anything like the real thing. 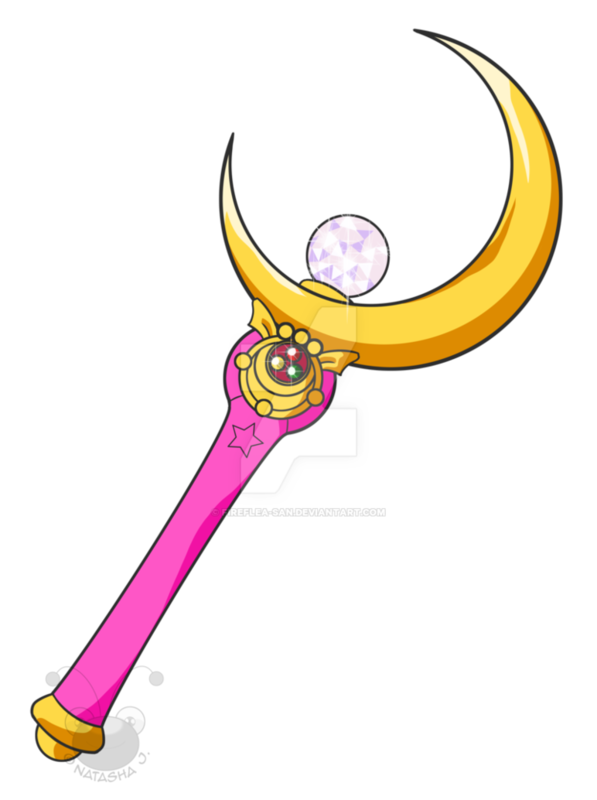 I modeled mine after the details on the actual Crescent Moon Wand. Picture made larger so you can see the details at the top of the stem. Upon retrospect, perhaps I should have expected the pink clay to darken like that, I didn't pick the lightest shade of pink, really. But other than the too dark pink, that looks pretty damn sweet. I was so excited at this part. I knew the pink was wrong, but I also knew I owned some pearly pink paint that I had bought for yet another Sailor Moon project (Makoto's pink rose earrings, freaking forever ago) that would be exactly the right color, and I know polymer clay has no objection to being painted. So I painted. And painted. And painted some more. It took like freaking five or six coats to cover that dark pink. This is like three coats in I think? And look how blotchy it still is. Geez. But I did eventually get it smooth. 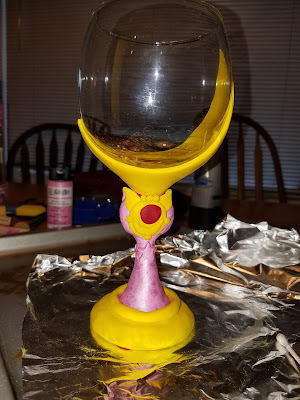 I also ended up doing like three coats of yellow over the yellow parts, there were some bits of lint and things in the yellow clay that I didn't like the look of, but since I wasn't actually changing the base color it didn't take as many coats as the pink. Partway through this process, Rachel had just the most amazing idea. You know how partway through Sailor Moon using this wand it gets the silver crystal planted in the crescent? Well, obviously with this wine glass the glass itself is kinda being the crystal, but what if one were to buy an actual round crystal and glue it to the bottom inside the glass? How amazing would that be? I promptly became obsessed with this idea and started looking into it. 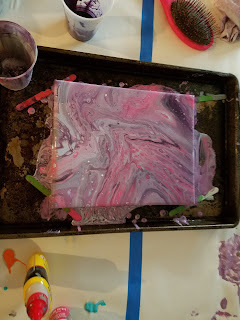 Obviously I couldn't just use any old glue and crystal in something I intended to pour liquid into and then drink, that's just asking to get poisoned. So after exhaustive research I located a food safe waterproof silicone adhesive that was meant for things like aquarium repair, which sounded perfect, and a nice safe non-lead poisoning glass crystal. Goddamn, did I search hard for that crystal. 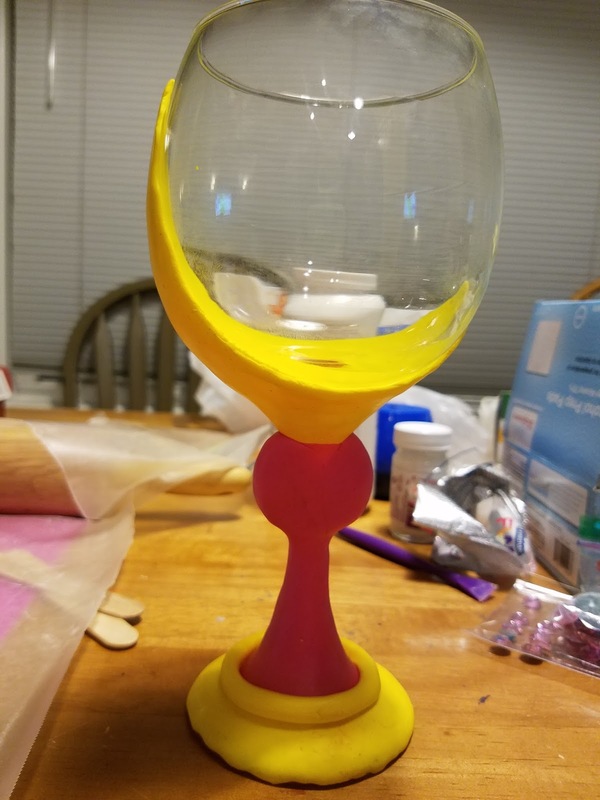 I didn't want to order it online because I didn't want to wait, but after hitting every damn craft store I could find and getting nowhere, I broke down and ordered one. Once it arrived, I glued it in, added the red, yellow and green gems to the red circle, (which I already had from some other project, I don't even remember what) added a coat of clear Minwax Polycrylic, (god, I love that stuff, I use it on everything) just on the clay parts to protect the paint finish, and then my Sailor Moon Crescent Wand wine glass was complete! Oh my god it's so pretty, I love it so much. 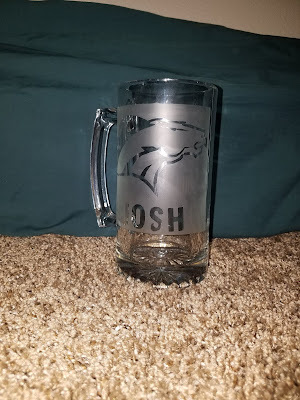 So, if I had ordered it from the Etsy seller, she had been selling them for $40-$50, I believe, and I don't know what shipping would have been but for something like this it's gotta be minimum $10, and I'd count myself lucky if it was that cheap. 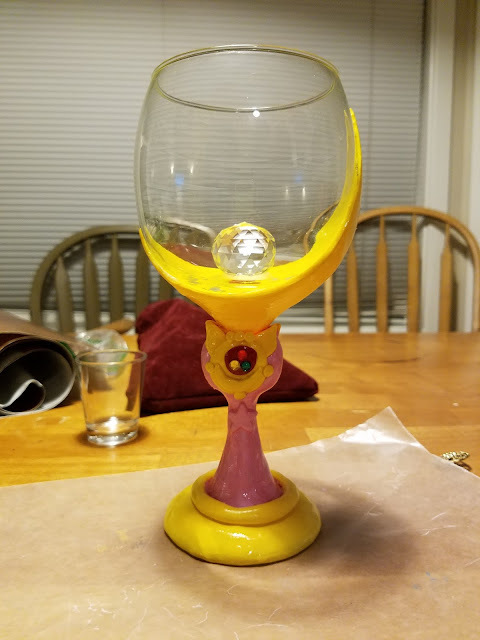 I spent $1 on the glass, $4 on the clay, $4 on the glue and $4 on the crystal. And I don't really count the glue, because I used such a small amount, and now I have the tube to use for whatever else I might need it for. It'll be handy for things like dish repair, if it's ever needed. And obviously the paint and gems don't count, since I had them from a previous project. So, even if you count the extras that I already had, this still cost me less than $20. And really, only cost me like $13. 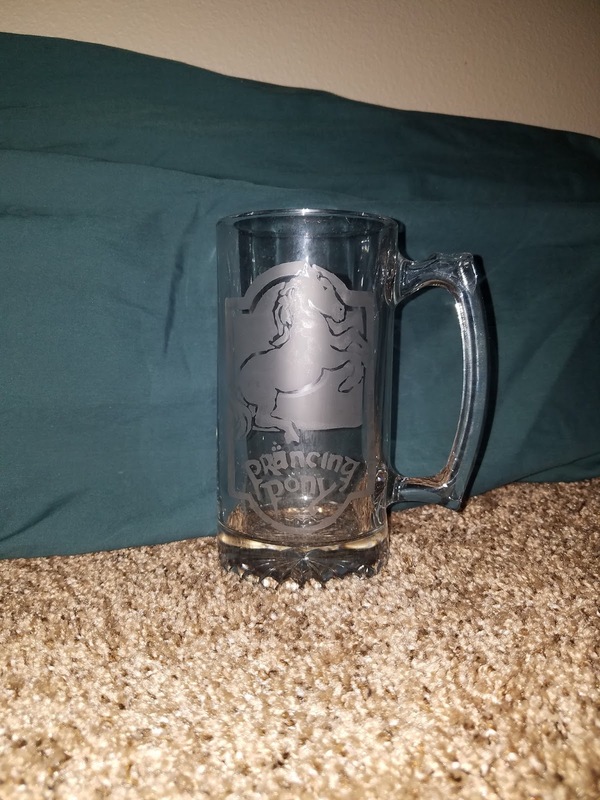 I'd say that's a pretty damn good deal, and I can't wait to drink out of this glass. Oh my god, isn't that so cute you could die? Shannon saw it and immediately demanded one, but there was no pattern for it, just an image. 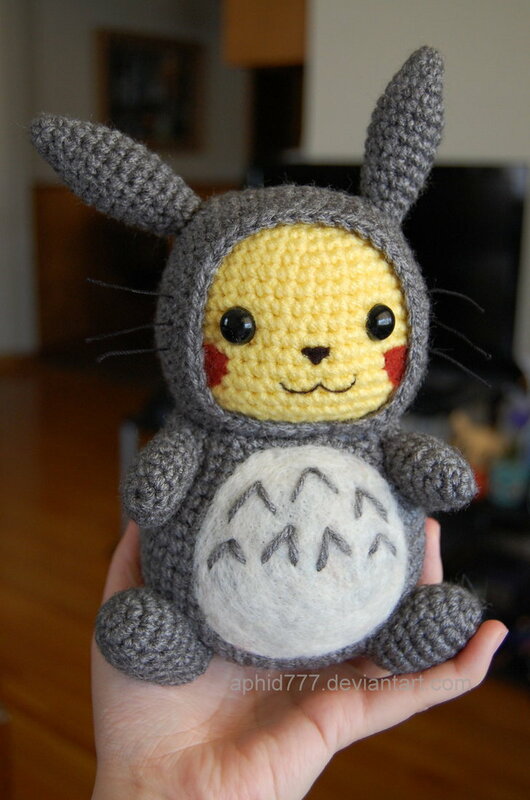 But after thinking about it, I realized it was really just a pikachu pattern done in grey with a yellow face and a border around the face to make it look like a hoodie. I could totally do that. So that's what I'm working on. Once I get it assembled I'll get some pictures. And yes, I am making two, I couldn't really just make one for Alara when I knew Shannon wanted one too that badly. I should have plenty of yarn, I hope. Okay. You tired of this post yet? I totally am. And I'm out.